A Ventura oil rig looks surprisingly etherial and beautiful at sunset, against the backdrop of the Channel Islands, but it's also a perpetual reminder that a single accident can have a catastrophic and long lasting impact on the fragile environment that surrounds it, and that the oil industry and our government officials need to be held accountable for safety and adequate prevention and emergency response. The ancient Greeks are said to have poured oil on troubled waters to calm the sea, possibly as an offering to appease the god Poseidon. In the era of wide-scale petroleum production, Poseidon would more likely be dismayed than pleased by the toxic sludge by the oil industry, like the pipeline leak in Santa Barbara County that dumped more than 100,000 gallons of crude into the ocean on May 19. Emergency responders clad in hazmat suits scoop globs of toxic tar off the cobbles at the site of the Refugio Oil Spill in Santa Barbara. Photo: U.S. Coast Guard Chief Petty Officer David Mosley, from the official Refugio Response media alert website. It’s deeply depressing to yet again witness the Santa Barbara coast awash in crude oil that is endangering and killing the birds, fish, sea lions, dolphins, and other marine life that so many have fought to protect with legislation and the creation of marine protected areas, since the catastrophic 1969 Santa Barbara oil spill galvanized the environmental movement in California. 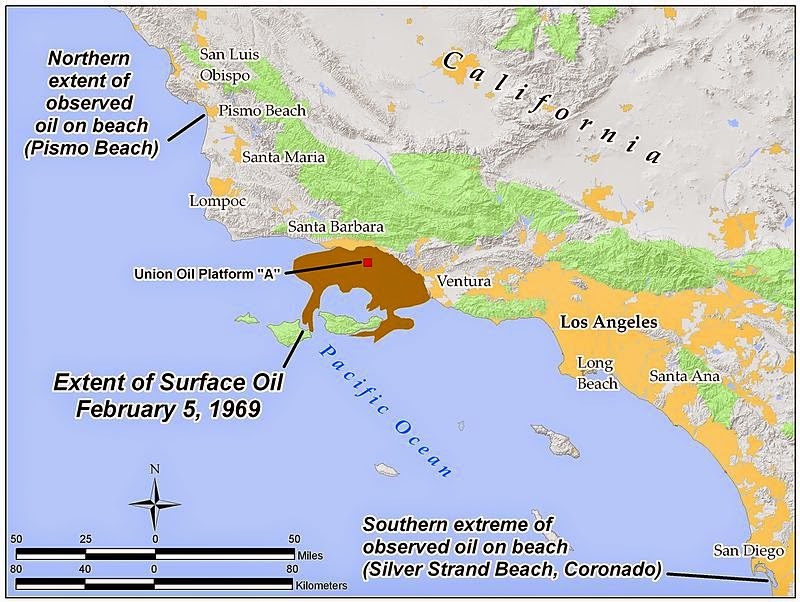 The first Santa Barbara oil disaster occurred at a critical moment in history for the oil industry in Southern California. Thousands of offshore oil leases were in play in the late 1960s—including more than 3000 in the Santa Monica Bay. That spill was a wake-up call. No one wanted to see a disaster of that scale happen again. The battle against oil platforms in the Santa Monica Bay was one of the first fights my parents threw themselves into in Malibu. They moved here the year of the spill and saw the aftermath of 11 million gallons of crude oil first hand. 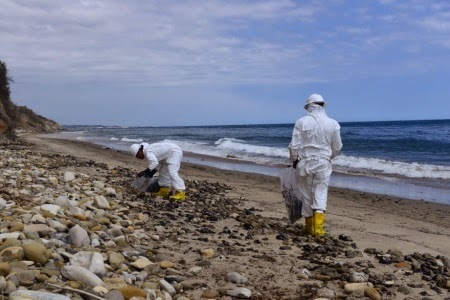 Although Santa Barbara and Ventura counties and the Channel Islands received the brunt of the damage, oil washed ashore as far south as the Mexican border and plenty of it ended up in Malibu. The impact of the 1969 Santa Barbara oil spill was felt from Pismo Beach to the Mexican Border. Plenty of oil, in the form of tar balls, washed up along the coast in Malibu. Image: Wikimedia Commons. Activists rallied. For Malibu conservationists, it meant petitions, letters, and buses packed with protesters bound for meetings in downtown Los Angeles. My mom remembers going to those meetings. “They told us they would paint the rigs blue, to match the sky,” she says. She also remembers the tar on the local beaches following the Santa Barbara spill. A bottle of nail polish remover was always in the beach bag with the sun screen and the towels. There are natural tar seeps in Malibu that were used by the Chumash as glue and to seal the seams of their boats, but the naturally occurring oil is never seen today in the amounts that washed up along the Malibu coast in the years following the Santa Barbara spill. Malibu was spared the industrial pollution experienced by many of the other Southern California beach communities during the oil bonanza of the early 20th century, but even this remote and inaccessible stretch of coast wasn't immune to the oil fever that swept the west in the 1920s and I was surprised to learn the extent of oil exploration in the area. 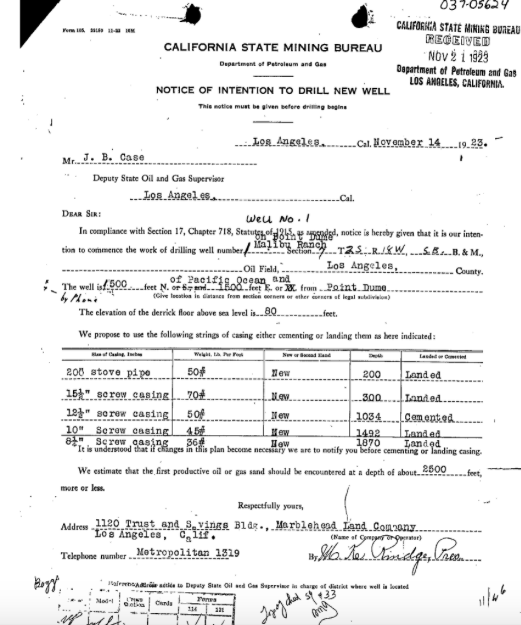 Here's a copy of the actual "notice of intent to drill" for the first Point Dume oil derrick, signed by May Knight Rindge and dated November 14, 1923. Someone has added a 1 to the first number in the site description, changing it from 500 feet from the ocean to 1500 feet. The photo below clearly shows that the distance from the Point is correct, but that it really is only about 500 feet from the edge of the cliff, not 1500 feet. This detail of a 1924 aerial photo shows the Point Dume oil rig, much closer to the cliff than the official description or local legend accounts for. The Adamson House Museum Archives website states: "May Rindge who was looking for sources of income to help fund her legal battles related to keeping a public road from crossing her ranch... sold some of the Union Oil Co. stock she inherited from her husband to finance [oil exploration]. [The well] operated for about two years, but no oil was ever found on the Rancho, at this or other sites. It actually contributed to her financial losses." Many longtime Malibu residents know the story of the Rindge oil rig on the top on Point Dume, constructed in 1924, but there was a second Point Dume oil well that was installed in 1940 and apparently abandoned in 1943. It appears that this second site is now under the garden of a well-known and highly respected musician. I wonder if he knows what is under his feet? 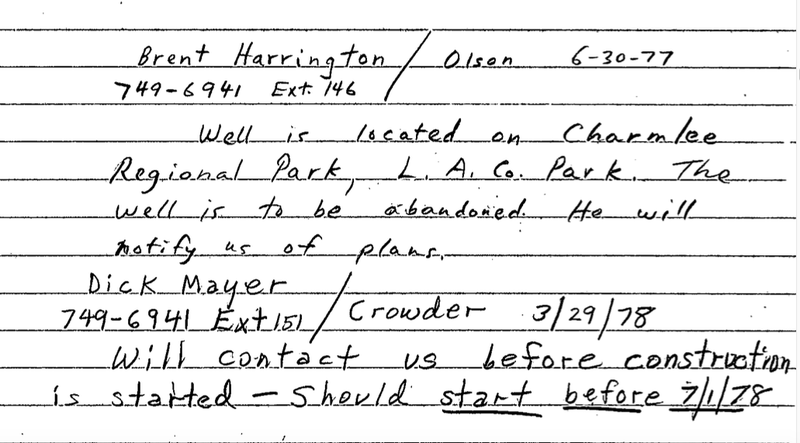 Here's the abandonment report for the second Point Dume well, dated August 17, 1943. 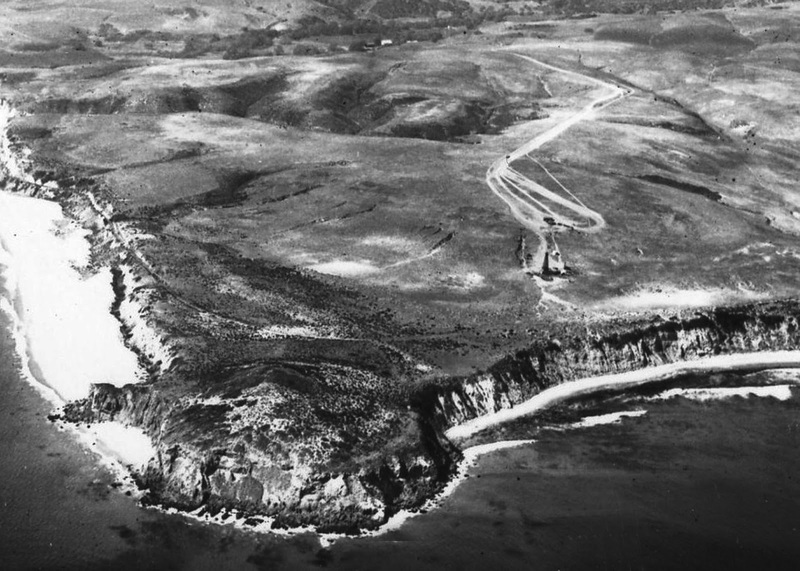 Point Dume was being used by the military during WW II and was off limits to civilians from 1942-44, probably complicating any oil drilling efforts. Records also reveal a well in what is now Charmlee Wilderness Park, and another, drilled in 1929 and plugged in 1930, down the street from Malibu High School. I was disappointed not to find any material on this well in the recent environmental reports released by the Santa Monica Malibu School District as part of the district's research on the site for the toxic substance clean up work plan that is being developed. The well location is near, but not on school property, which probably accounts for the omission. Although this is one of the only wells on the Malibu map that is listed as oil producing. Evidence of the Malibu Park oil well location is clearly visible in several of the excellent aerial photographs provided as part of the SMMUSD's Draft Preliminary Environmental Assessment Work Plan for Juan Cabrillo Elementary, Malibu Middle and High Schools. This image from the Adamson House Archive is described as the Rindge family's Point Dume oil derrick. This doesn't seem possible, because it shows PCH running between the ocean and the bluff, but it would make sense if this is the Malibu Park oil rig. If you compare it to the 1944 aerial photo, below, it synchs up quite well, including the beach house in the foreground. The angle is different in this 1944 image, but the beach house is visible, front left, and there are still scars on the bluff top from the oil derrick installation, including the circular track visible in the Adamson House photo. Today, this would be near the corner of Morning View Drive and Merritt Drive. Here's a detail of a report on the Malibu Park oil drilling operation. There's much more, including core sample information, at the state well records archive. The 1964 inspector speculated that one well may be under the parking area of the Carbon Canyon fire station. The map places the second well, described as 605 feet deep, under a massive house on the hill overlooking the highway. That doesn’t refer to mountain lions or bob cats, but to oil exploration in an unproven area. Two sites in a remote portion of the Santa Monica Mountains above Charmlee deep in Encinal Canyon are also listed as wildcat wells. Both appear to have been drilled in 1923. How the crews lugged drilling and derrick equipment up the canyon is anyone’s guess. That area is still remote. 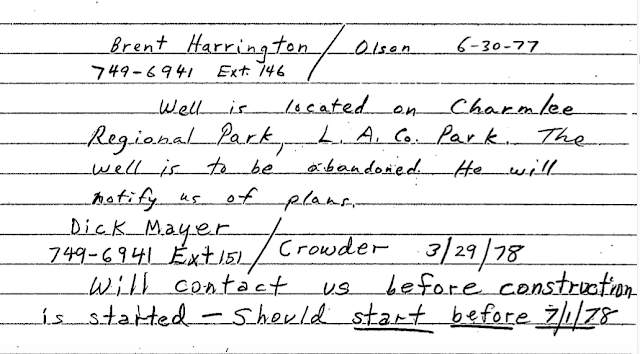 Here's the well inspector's note from a report on the Charmlee area well site in 1978. Another report indicates that neither this well nor the other two Encinal well sites were ever located. 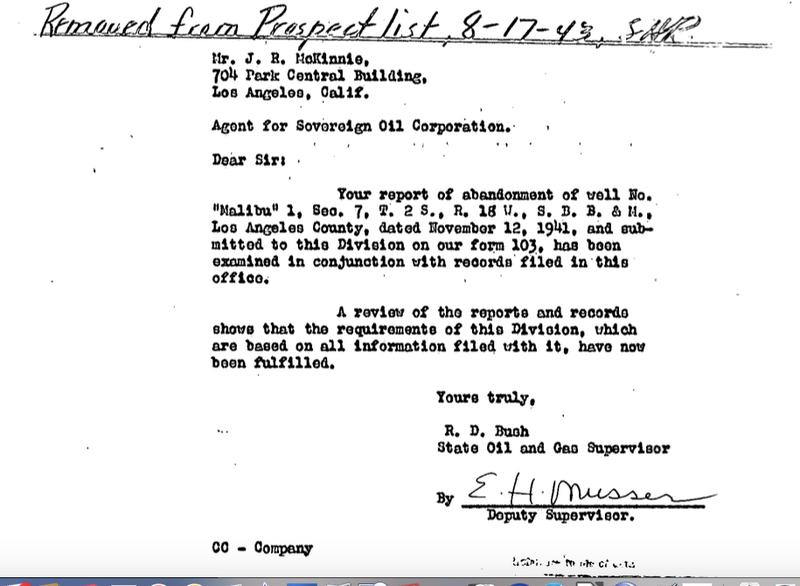 An inspection in 1977 failed to find any trace of the Encinal wells. None of these wildcat wells appear to have yielded anything, but it’s interesting that, as of 2005, Chevron still apparently held the lease on two wells in the Decker Canyon area. The first of these was drilled in 1957 for the Gulf Oil Corporation. A Division of Oil and Gas report on proposed operations dated August 8, 1957, reveals that the wells were located on a mineral rights lease of 470 acres, and that the depth of the first well is listed as 7000-7500 feet. A map accompanying the claim shows parcels tagged by oil companies Franco Western, Texas, and Standard, scattered among the more familiar names of the local settlers, like the Deckers and the Kincaids. This map records oil leases on homesteads in the Yerba Buena and Decker area. It's available as part of the well record for one of the two Texaco leases in the Yerba Buena area, on the State of California Department of Conservation Division of Oil, Gas, and Geothermal Resources website. These early wells may not have yielded results, but they were just the beginning. A quick survey of the California Division of Oil, Gas and Geothermal Resources Well Finder reveals 25 well locations in the Malibu area. During the 1960s and 70s, the big oil companies began drilling test wells off shore. Malibu oil drilling sites from the 1920s through the 1970s are marked on the State of California, Department of Conservation, Division of Oil, Gas, and Geothermal Resources website interactive map. According to the map key, the black and white symbol means a "dry hole" that has been "plugged and abandoned," while the black symbol is suppose to mean oil was recovered. 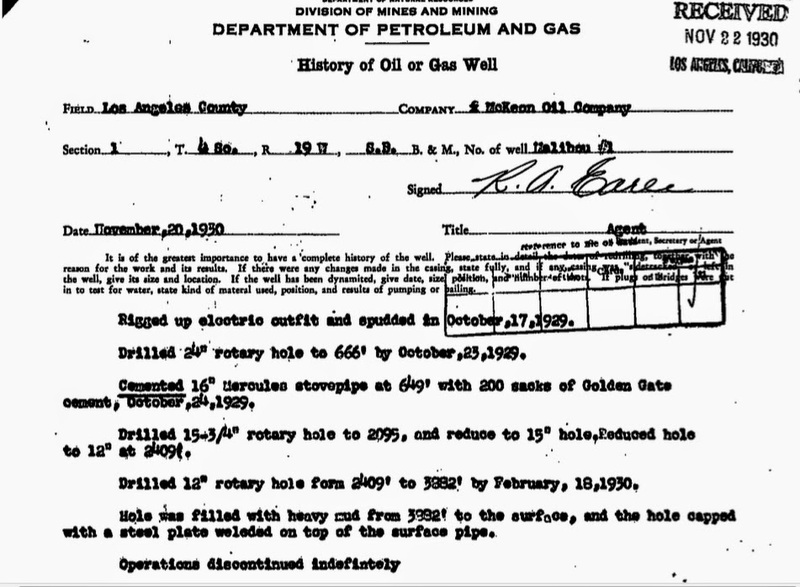 However, I could find no official record of oil recovery at the "McKeon" well in Malibu Park, the two "Rieder Haag Co." wells at Carbon Canyon, or the two "Salisbury" wells in the Decker Canyon area, despite their designation here as productive wells. 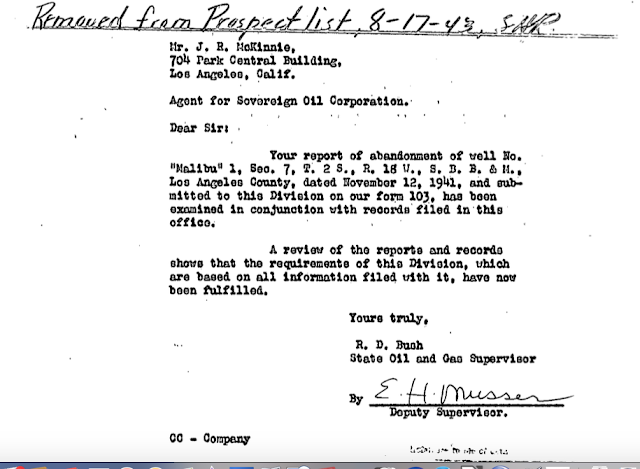 Record keeping was minimal during the early oil exploration period, and there are reams of letters from the state's oil officials attempting to track down well logs and even locations of old well sites in Malibu, with little success. There appears to be no way of knowing what was found, or even exactly where the drilling took place in some instances, and there may be still undiscovered well sites. Chevron filed drilling reports for a site off Bluffs Park in 1970, which appears to have been previously owned by Standard Oil in the 1950s. There was a test well off Puerco Canyon in 275 feet of water drilled by Shell Western Exploration and Production, Inc. in 1969. 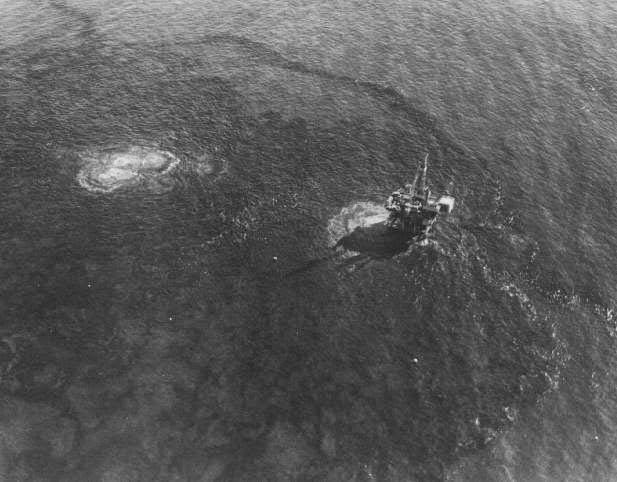 Exxon Mobile drilled a test well off the coast at Paradise Cove in 189 feet of water in 1970. There is a “notice of intention to drill” form dated 1965 for this site stamped “prospect well confidential, please do not publish," but the lease expired in 1998 and the data was released, along with a memo that states that the well is near other state and federal leases, despite the fact those leases were technically placed off limits in 1994. An August 28, 1974 Los Angeles Times article states: “[The] Assembly asked the U.S. government not to consider leases for 5,000 offshore oil wells between Laguna Beach and Malibu until a Federal Energy Administration report [is completed]." Drilling was stalled, at least temporarily. The lobbying power of the oil industry could not combat the anger and determination generated by the 1969 Union Oil platform disaster. The tar fouling beaches, rocks, and marine life along miles of coast was a constant reminder of the disaster that could not be ignored, but not for want of trying. A renewed push for drilling in the 1980s resulted in the federal government authorizing 37 vast offshore lease areas from Point Mugu to Santa Maria. Here's a clipping from the May 22, 1980 edition of the Malibu Surfside News that my mom saved. 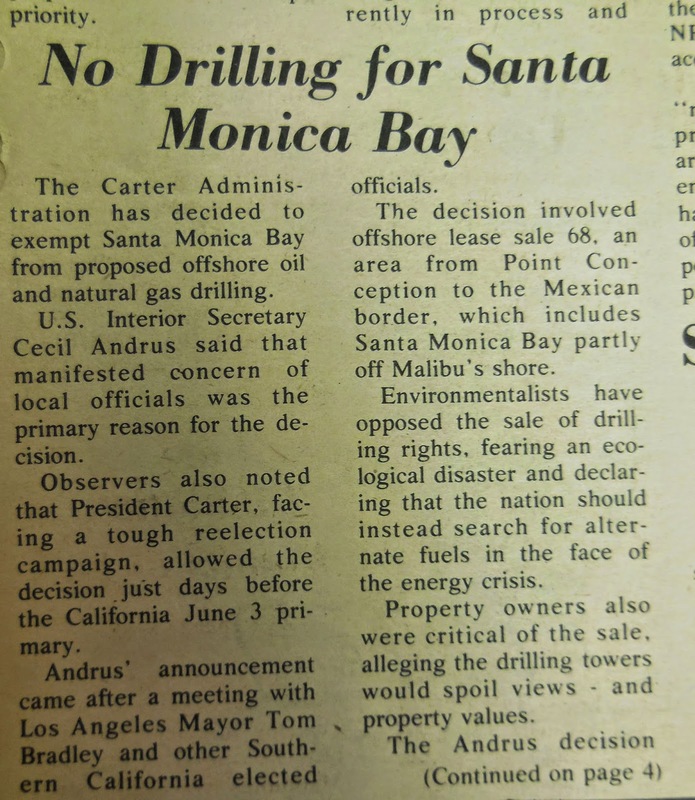 It reports on the Carter Administration's decision to remove the Santa Monica Bay from the list of proposed oil leases, 35 years almost to the day of the Refugio spill. 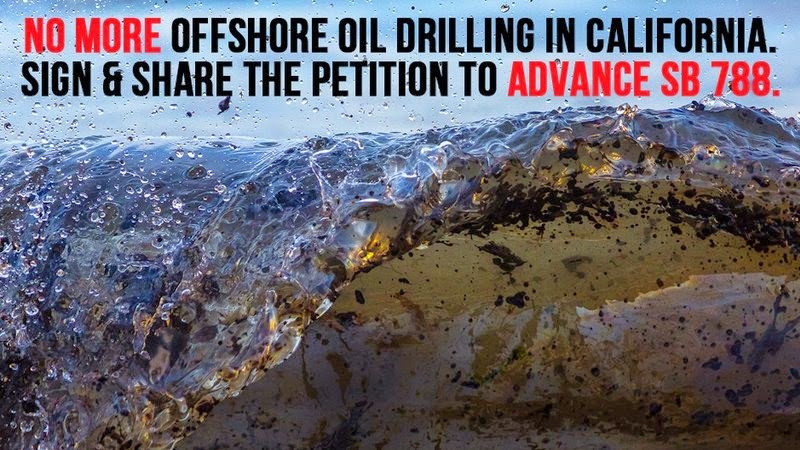 In 1994, the state passed the California Coastal Sanctuary Act, which “declares that offshore oil and gas production in certain areas of state waters poses an unacceptably high risk of damage and disruption to the marine environment of the state.” That act protects the coast, including the Santa Monica Bay, from new oil drilling projects, but there is a major loophole. 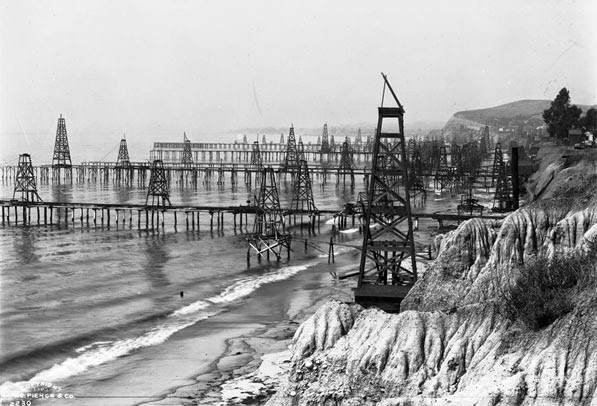 A postcard shows the Summerland offshore oil rigs that transformed this stretch of the Santa Barbara coast from an idyllic beach town into a suburb of hell in the 1890s. This field, the first to be developed in Santa Barbara County, played out by 1940, but extraction continued off the coast of Summerland throughout the 20th century. 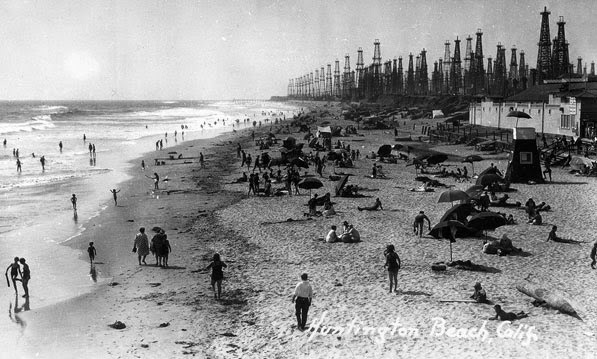 No viable oil was apparently ever found on Malibu's beaches, but Huntington Beach, Playa Del Rey, Venice and Long Beach were all transformed by the oil boom of the 1920s and '30s. The oil companies made the money, not the residents. Schools closed, the Venice "Grand Canal" was so full of oil it reportedly caught on fire on more than one occasion. By the 1990s, it was all over. the State Lands Commission denied City of Los Angeles permit applications for slant drilling under the bay, and the shore fields were mostly played out. There are still thousands of active and potential wells in Southern California and conservationists are concerned that the oil industry, which has a bottomless war chest for lobbying, will eventually find a way to exploit that loop hole, leaving the coast vulnerable to future drilling projects. That’s why Marin County state senator Mike McGuire is proposing state bill 788, to close those loops and limit future offshore oil projects. The California Coastal Protection Act of 2015 will delete the authorization, and remove the oil industry’s foothold. 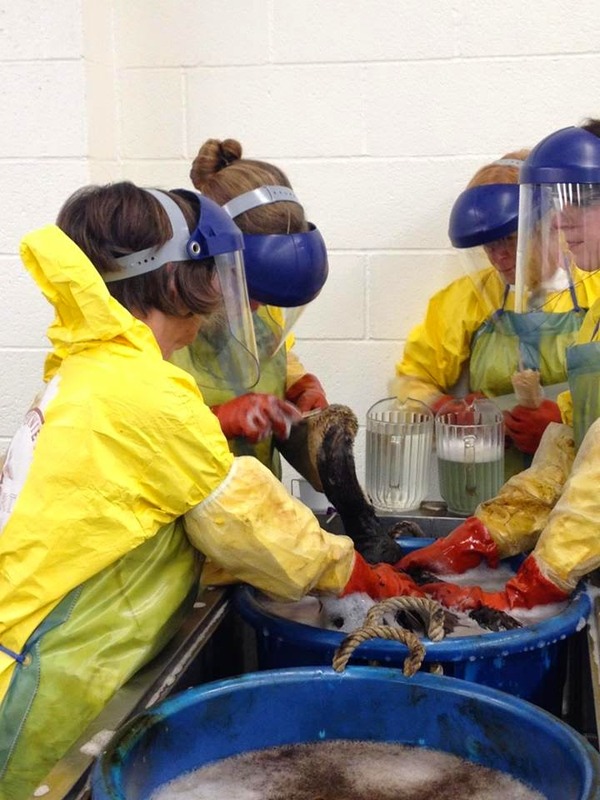 California brown pelicans undergo the lengthy and uncomfortable process of being de-oiled at the International Bird Rescue facility in San Pedro following the Refugio oil spill. These birds were lucky: they were rescued and treated quickly, and have a good chance of survival. Oil burns eyes and skin and eliminates the water resistance of the birds' feathers, putting them at risk of hypothermia and drowning. Photo from the International Bird Rescue website. Malibuites can help by signing the Change.org petition supporting the measure, and by calling their representatives and asking them to support SB 788. 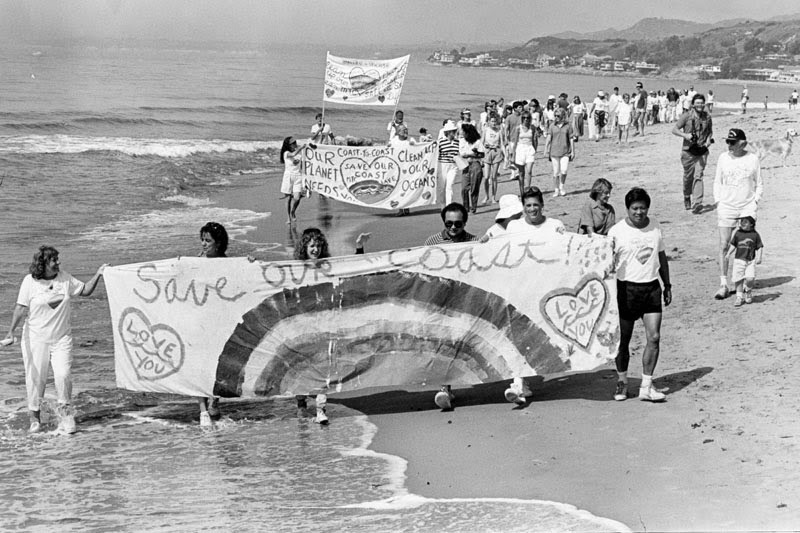 Los Angeles Herald Examiner photographer Mike Sergieff documented Malibu residents participating in a Save Our Coast rally to protest ocean pollution, September 4, 1988. The photo is in the collection of the Los Angeles Public Library. 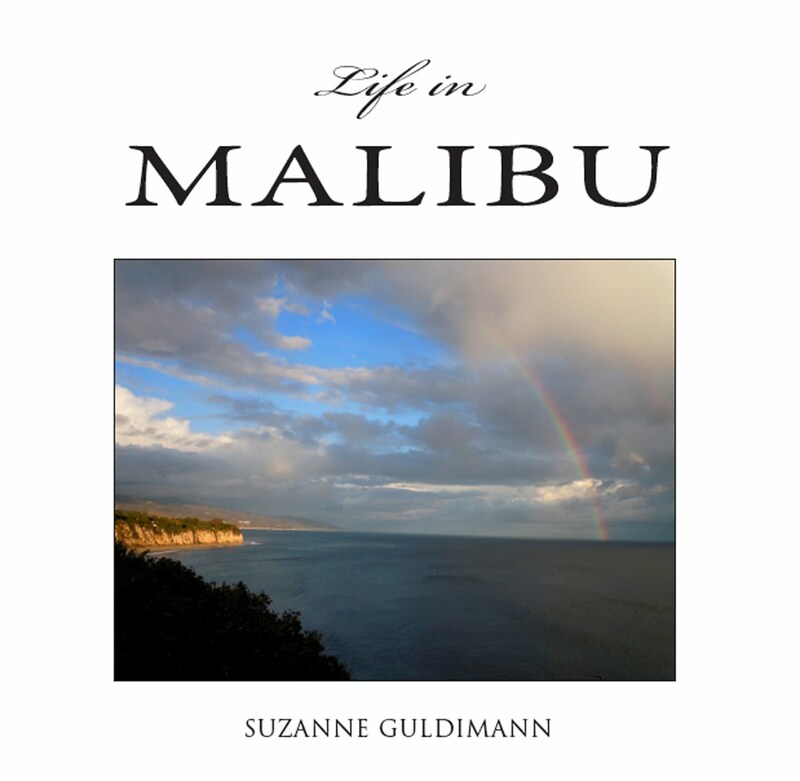 The vast majority of Malibuites, whatever their stand on other local issues, have always come together to support ocean causes, whether it was protesting oil development or supporting the creation of marine protected areas. The Refugio oil spill should be a call to arms to help our neighbors in Santa Barbara. Santa Barbara’s wildlife also needs our help. The International Bird Rescue's oiled bird team at San Pedro is currently assisting with the de-oiling effort but depends on donations to carry out this work. You can also follow their Refugio efforts on the IBR Facebook page. It only takes a minute to sign and share a petition, or call or email our officials, but with enough support it can make an impact. Animals are going to die as a result of this spill, despite the best efforts of rescuers. Dolphins, sea lions, seals, birds, lobsters, fish, zooplankton so small it isn't visible to the human eye, and ocean giants like whales and elephant seals will all be impacted. That's the grim reality of an oil spill this size. It will take years for this spectacular stretch of California Coast and all the biodiversity that makes its home there to recover. Sea lions are one of the marine mammal species currently being impacted by the Refugio spill, along with dolphins, harbor seals, elephant seals, and potentially humpback and gray whales and sea otters. Five pelicans, two sea lions and a dolphin have already died, according to the Ventura County Star. Five elephant seals and 12 sea lions are currently being treated at Sea World's Oiled Wildlife Care Center in San Diego. However, out of this disaster an opportunity to prevent future oil spills is emerging. This doesn't have to happen again, not in Santa Barbara, or Alaska, or the Gulf of Mexico, not if we all work together for change. We are constantly barraged with bad news and tragedy on an epic scale, but this is one of the times when we can help create meaningful change.